Kokoskaa’s budget wrap line has blown me away again. First with Brave, and now with Brave’s little sister Hope. 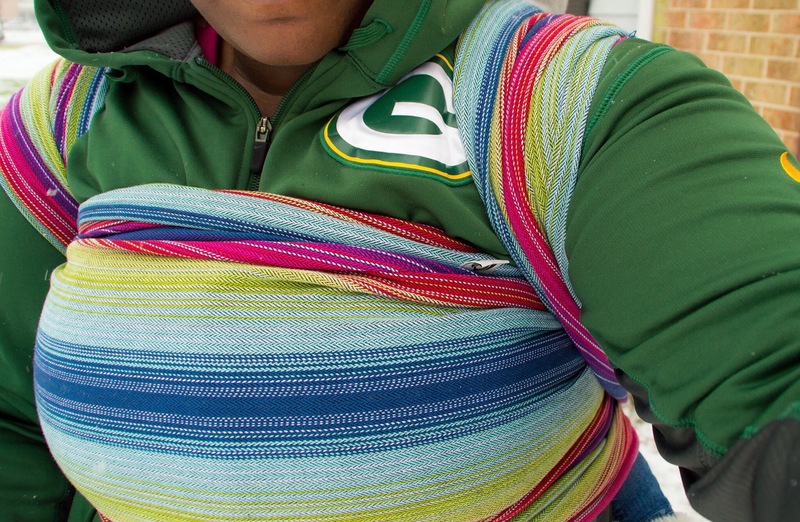 Hope is a gradient rainbow wrap. Kokoskaa offers it in white and black weft and I have enjoyed using the black weft for about five weeks now. 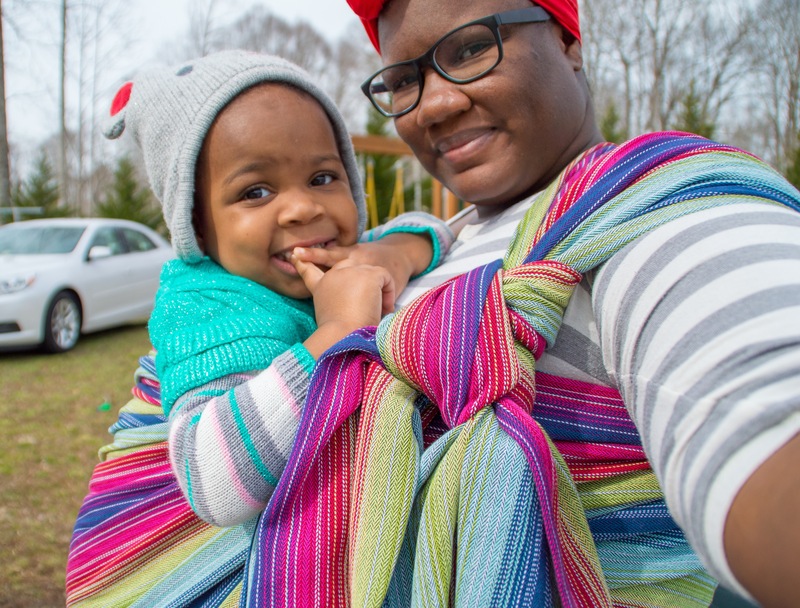 This has been one of my go to wraps while it has been here and thanks to the fun colors, Maxine (30ish lbs, 2T/3T Clothing) has been picking this one for uppies all the time. When I received the wrap, it had been washed once and I immediately noticed the difference between this and Brave. Hope is thinner, softer, and easier to manipulate than Brave. The first carry I did was a ruck. The first picture in this post was actually the first time I wore the wrap and I was so pleased! 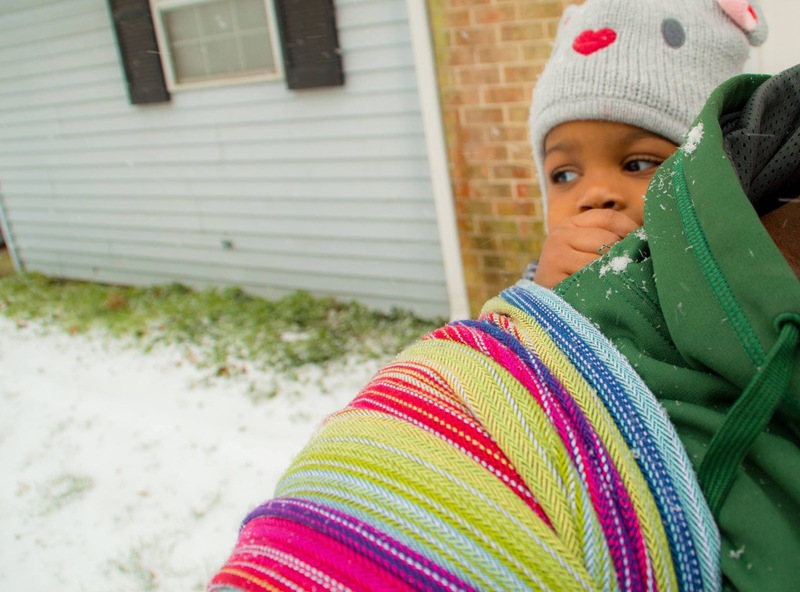 The wrap feels flat on the shoulders with no cush, but it was still comfortable. I enjoy flat wraps, especially when they are not diggy and Hope is not diggy at all. I also did about a dozen semi front wrap cross carries with this wrap. Since the wrap I tested was a base -2 for me, I had to do my favorite carry! It pleated so nicely on my shoulder. It held the slipknot like a rock star as well. There is little stretch to this wrap and basically zero bounce. It glides very easily and there is not much texture to it. Very smooth. In a double hammock, the chest pass basically spread itself which seems to be the case with all of the Kokoskaa wraps I have tried. What magic is that?! Even wrapping over a jacket was pretty easy with Hope. 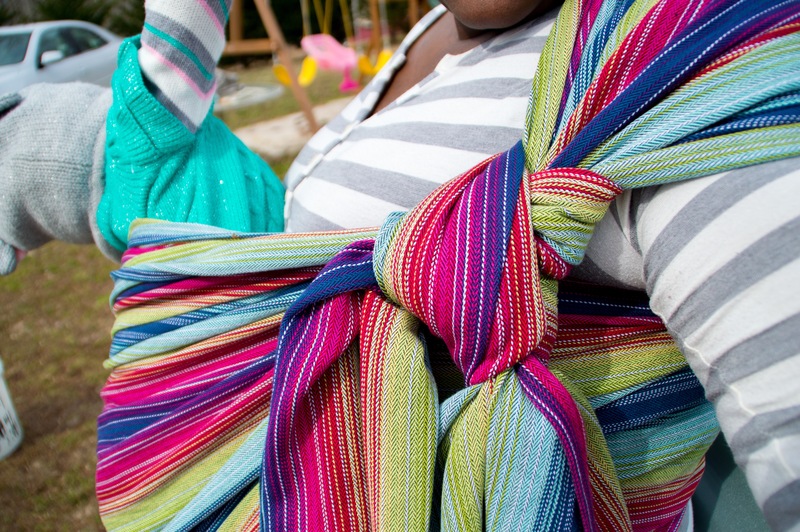 Hope would be great for wrappers of all skill levels and would be suitable for newborn up through toddlers. 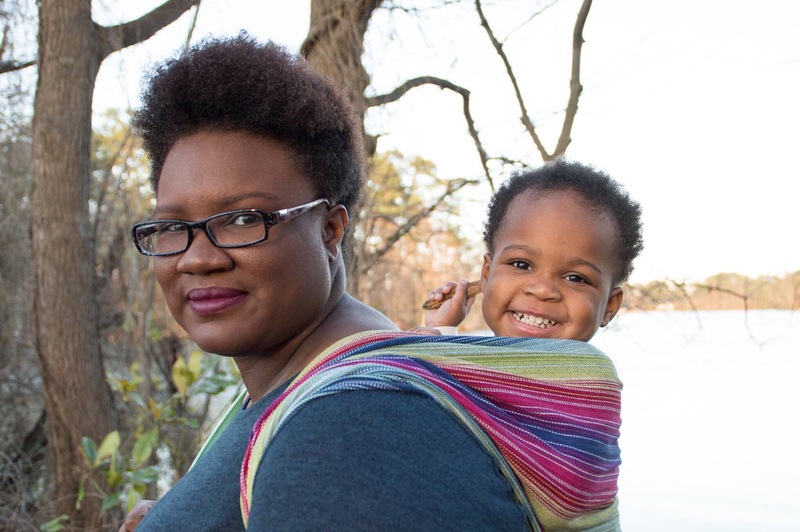 If you like thinner (but not too thin), solid, and easy to break in wraps, this wrap is for you! The Kokoskaa budget line is all under $99. Be sure to follow Kokoskaa on Facebook and Instagram! Also join their Facebook chatter group!